the cinderella project: because every girl deserves a happily ever after: Why Thank You! What a way to start off the New Year! 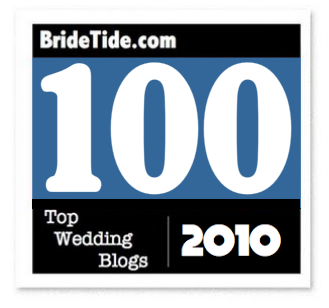 Bride Tide blog unveiled their Top 100 Wedding blogs to follow in 2010 and guess who made the list? Yup - little ole me! A big thank you to all you readers for your support of the cinderella project! And don't forget to check out the entire list for all your wedding ideas!